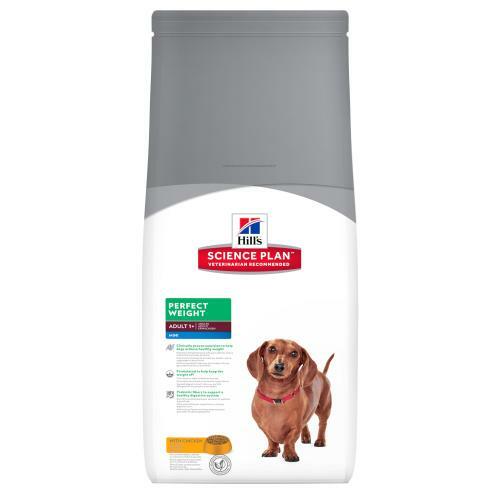 Hills Science Plan Perfect Weight Adult Mini is a finely balanced and nutritionally complete dog food for smaller breed dogs from 1 year of age. Designed to help your hound achieve and maintain a healthy weight to allow them to live a longer, fuller life. Perfect for sterilised dogs and other canines with a tendency towards weight gain, this weight management food contains dietary fibre to help your pet to feel fuller at meal time, added L-Carnitine contributes towards a healthy heart and fat burning whilst contributing towards the maintenance of lean muscle mass, alongside natural antioxidants to help strengthen the immune system. Wheat, maize gluten meal, maize, chicken (16%) & turkey meal, pea bran meal, cellulose, tomato pomace, digest, animal fat, flaxseed, dried beet pulp, coconut oil, minerals, L-lysine, dehydrated carrots, lipoic acid, L-carnitine, vitamins, taurine, trace elements and beta-carotene. With a natural antioxidant (mixed tocopherols).